Is it difficult trekking into Everest Base Camp in Nepal. People always ask me, is it difficult trekking to Everest base camp? Let’s have a look. I have journeyed to Everest base camp 30+ times to date and climbed to the top of Mt. Everest. I make this journey two or three times per year. Sometimes the journey is more difficult than others, depending on how I adapt to the lack of oxygen. The Everest Base Camp Trek is not for tourists. Trekking to Everest base camp is an adventure of a lifetime and life changing for many people. It is achievable for most people but NOT A TOURIST TREK!! and needs to be respected, prepared and trained for. 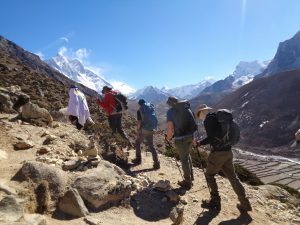 There are a couple of key elements to a safe, successful trek and journey up through the Khumbu valley, hiking at low level oxygen environments and making a safe, successful and enjoyable trek. Watch one of our Everest Base Camp video’s and read more below and then GET IN TOUCH. 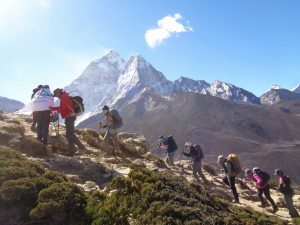 Some people find the trek to Everest easy and these people are used to back packing hiking up and down hills and have excellent strength and endurance and have experience hill walking, climbing mountains and generally active on a weekly basis. So you need to assess the information you read on the internet. If someone says it was easy look at their situation and preparation. Anyone who says it was the hardest thing they have ever done. Again you need to look at the itinerary, training, pacing and lodges they stayed in. You need an honest assessment of your fitness, age and how much preparation is needed to enjoy the overall experience. CONTACT US and we can help you get the correct information to make a safe and successful trek to Everest. Read some REVIEWS from our trips. Be informed to make the best decisions for your trek. You need to get all the information before trekking to Everest Base Camp. Think clearly about how you should prepare. Elevation gains, plus the daily distances on the trek then factor in lack of oxygen and you get a training plan that will work. Remember muscle strength and specific physical conditioning for long days and distance walking at altitude is really important. Find out everything you need to know about trekking to Everest. – How many days do I need for the trek into Everest Base Cmap? 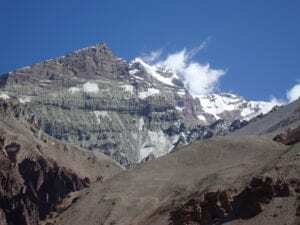 You should be arriving into base camp on day 9 of your trek. – What are the elevation gains on the Everest Base Camp trek? Read more about the elevation gains each day on the trek to you can develop a good training plan. – When is the best month to trek? March, April, May, late September and October and November. I prefer, March, April, September and November. READ MORE. – How much should I be training per week? This depends, 7 to 10 hours per week at least 3 to 6 months before the trip. Make sure you pick the right itinerary. You need to have 3 days acclimatizing to the low levels of oxygen around 3,500m/ 11,500 feet around the town of Namche Bazaar. All altitude related research suggests that you need acclimatize well at this critical point. If you fail to acclimatize well at this height you run a serious risk of getting serious altitude sickness higher up the trail. Check out our Itinerary. Have an effective training program. You need to have an effective training program at home that gives excellent physical conditioning. Add weight to your backpack gradually building from 6kg to 12kg / 12lbs to 25lbs over 3 to 6 months of training. Building your hiking training from 3 – 6 hours once a week on uneven terrain both up and down hills. You should also be training an additional 4 times a week. 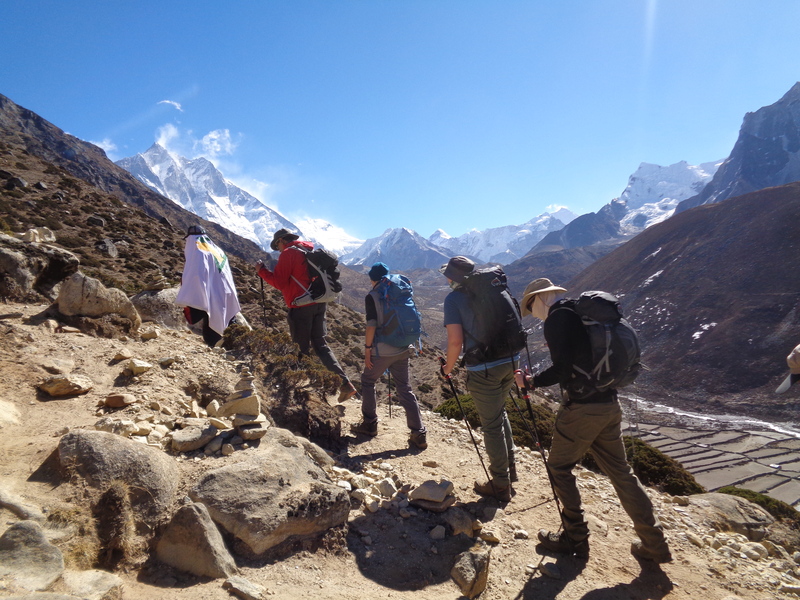 If you are on one of our treks to base camp, we are available to help you get specific information and help you get the conditioning needed for this long trek to and from Everest. Add some weight training to your program. Have a weights training program that gives excellent condition in your legs, calf’s, shoulders, core stability and back. You should try and work on your balance as a key element of your training. You will be walking on mixed terrain up and down hills and steep steps for 13 days with long days on your return from base camp back to Lukla. You will have three 20 km days. You need excellent preparation before joining our treks to Everest base camp. Conserving energy on the trial is critical to success. When you start the trek to Everest Base Camp you are at 2,850m/ 9,000 ft and start walking to 5,364m/ 17,500ft high in the Himalaya’s. Slow your walking pace drastically. The key with climbing any mountain or trekking to altitude is to expend as little energy as possible moving from one village to the next. Yes, physical exertion is an important part of acclimatizing, along with hydration (4/5 liters per day), eating well and sleeping. Just make sure you keep your walking pace slow and keep your heart rate at a manageable rate and not to fatigue your muscles and aid the recovery process as you move to higher altitudes. Make sure you have you have professional guides. You will be learning to walk again and pace yourself as your body will have lower levels of oxygen to work with. The slow approach with an experienced guide will get results. We have 99% success rate on our trek to Everest base camp. You can walk in the hills at home with extra weight building from 6kg to 10+ kg for 3 – 6 hours along with weight training and other endurance training you can easily build up the correct fitness in a 3 – 6 month period depending on where your starting point of fitness is. Check out our Everest Base Camp Trek information and read more blog posts on Everest base camp, training, preparation and getting ready for your adventure. We have the Everest experience you are looking for. If you would like to talk more about specific training required for mountain treks, feel free to get in touch. We have a wealth of experience. 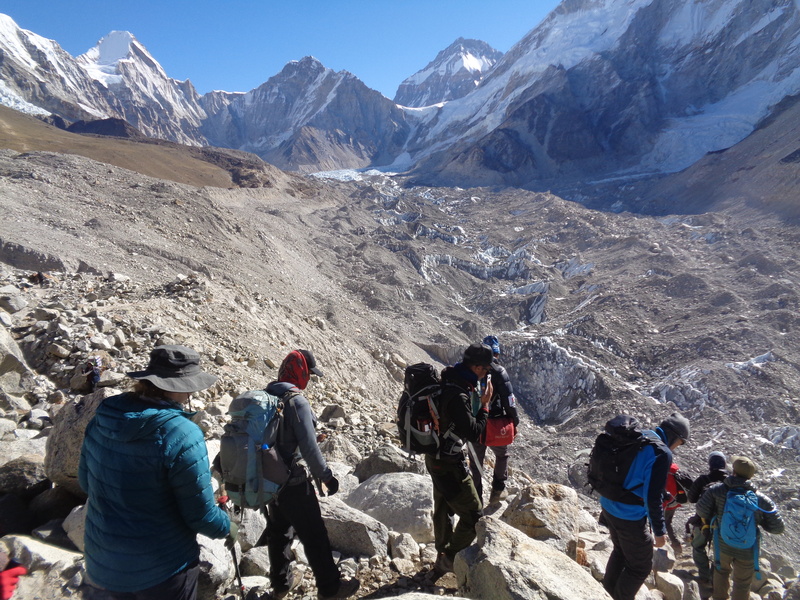 Our Everest Base Camp Trek have 99% success rate to date and we have a 45 page dossier on the trek, training plans and we are available 5 days a week to help you get trained up and have all the information you need to make this journey to Everest base camp.